A system and related methods and components for treating tissue swelling, and particularly swelling associated with cerebral edema, compartment syndrome, and congestive heart failure, by the use of water removal therapy, in order to remove only water from biological fluids. Included also is a system for such use that incorporates one or more monitors, optionally in addition to the use of water removal therapy. By removing only water, all other biologic agents, including essentially all solutes and formed blood elements (such as cells) are increased in concentration in the remaining bodily fluid(s). WRT can be applied to several clinical conditions in which there is an excess of water, and is ideally used in an extracorporeal fashion, in combination with other functions and related components as well, including ultrafiltration. The present application is a continuation-in-part of US patent application filed Mar. 22, 2002 and assigned Ser. No. 10/104,113, the entire disclosure of which is incorporated herein by reference. It would therefore be highly desirable to have a treatment regimen that could result in: 1) normalization of serum sodium concentrations to turn off signals to retain sodium, 2) increased urinary excretion of sodium after normalization of inappropriate neurohumeral signals to retain sodium, 3) a net loss of body water, primarily from the interstitial space, and 4) avoidance of excessive intravascular volume loss that can aggravate low blood pressure. FIGS. 12-21 provide various views and steps arising in the use of a system such as that shown in FIGS. 1-4. FIGS. 24-26 show alternative schematic diagrams of the use of ultrafiltration in combination with water removal therapy. FIG. 27 shows a diagram of a cartridge of the type prepared and used in Example 1 below. For instance, given this rate of water removal, Q can be provided in the range of from about 10 −8 to about 10−5 and more preferably from about 10−7 to about 10−6. Cwsaturated is between about 0.1 to about 50 mmoles water/m3, and more preferably between about 5 to about 20 based on water vapor pressure of tissue at 37 degrees C.
Cw intake, though expressed in mmoles water/m3, can be determined from corresponding dewpoint values (where dewpoint is the temperature at which air must be cooled for condensation to occur). With increasing amounts of water in the air, it can require only a slight reduction in temperature to cause condensation. If the air is fairly dry, it requires colder temperatures to produce condensation. Dewpoint, in turn, can be converted to g/m3 or mmoles/m3. The experimental results below show that even relatively moist gas can be used effectively, so long as its velocity is sufficiently high. Hence where the hydratable medium is air or similar gas, its dewpoint is preferably less than about 10, and more preferably less than about 1. The flow velocity v of gas within the fibers can be between about 1 l/min to about 100 l/min, and preferably between about 2 l/min and about 25 l/min, all per 1000 cm 2 of fiber surface area, and k can be on the order of about 0.1 to about 50, and more preferably is between about 2 and about 20. Given a particular water removal rate, per fiber, the total water removal then becomes largely a function of the number of fibers employed. An extracorporeal cartridge for use in the present invention will typically include between about 1 and about 10,000 such fibers more preferably between about 1,000 and about 5,000 fibers. Suitable materials for use as semipermeable membranes of the present invention provide an optimal combination of such properties as mass transfer properties, biocompatibility, surface-to-volume ratio, processability, hydrophobicity and hydrophilicity, strength, transport rate, and porosity. Examples of suitable hollow fibers are described, for instance, I. Cabasso, “Hollow-Fiber Membranes”, pp 598-599 in  Kirk Othmer Concise Encyclopedia of Chemical Technology. In a preferred embodiment, such membranes are provided in the form of “hollow fibers” or “microcatheters”, having walls (or portions thereof) formed of such membrane material. In alternative embodiments, the membranes can be provided in any suitable form or configuration, e.g., in the form of pleated or corrugated membrane sheets, and the like, preferably positioned within and/or by a recovery catheter. In situations where the semipermeable membrane(s) are provided in other than circumferential (e.g., fiber) form, the hydratable medium can be delivered to a major surface of the membrane, opposite the surface in contact with, or accessible by, the tissue fluid itself. A system such as that shown in FIGS. 1-4 can be used with the following protocol and instructions in order to treat sites at risk for compartment syndrome. Patients considered candidates for prophylactic use of compartment syndrome therapy must meet all of the following criteria: 1) be at risk for compartment syndrome, 2) have a single fracture, 3) have closed or Gustilo grade I open tibial shaft fracture that requires surgical stabilization, 4) are skeletally mature (generally over age 16), 5) have no other traumatic injury, and 6) be mentally alert and able to sign patient consent form. The vacuum line  134 is connected to the catheter's outer tubing. The female luer at its proximal end is connected to the vacuum pump. A vent 136 with a 0.2-micron filter is attached to the vacuum line. The vent is normally closed and can be opened to relieve vacuum pressure by removing the attached cap. The fluid collection line is connected to the vacuum line. The female luer at its proximal end along with the protruding drip tube 138 are inserted into a 3 cc syringe acting as a sample collection reservoir. Sterile 3 cc syringe with cap (Becton Dickinson, Franklin Lakes, N.J.), part #B-D, 3 ml Luer-Lok™ syringe. 3. Set PAUSE Interval. Adjust the pump's “Pause Time” to 03 minutes. (See FIG. 18 for pump settings  140). FIGS. 24-26 show various alternative embodiments of systems that employ WRT and ultrafiltration in the manner presently described and claimed. Ultrafiltration cartridge  206 is shown as a hollow fiber cartridge that allows blood flow through the lumen of the hollow fibers. Ultrafiltrate flows across the hollow fiber walls and out the cartridge sideport under negative pressure. Ultrafiltration pressure sensor 208 measures the flow pressure of the ultrafiltrate draining from the ultrafiltration cartridge, while ultrafiltration waste collection bag 210 collects the ultrafiltrate draining out of the ultrafiltration cartridge. WRT cartridge  212 is also provided in the form of a hollow fiber cartridge that allows blood flow through the lumen of the fibers, while the WRT dry air technology removes water transluminally from the blood. Water vapor is removed from the cartridge through a side port. A dry air source will be attached to one side port while the vacuum is pulled through the condenser which is in turn attached to the other side port. Both the UF cartridge and WRT cartridge can be provided in the form of an elongate housing defining a central axis; the housing containing a plurality of elongate hollow fibers each positioned within the housing substantially parallel to the central axis and defining an extrafilamentary space within the housing, each of the hollow fibers being formed of a material which allows molecular transport therethrough. As also shown in FIGS. 24-26, dry air source 214 will generally be provided in any suitable form as a source of dry air which is pulled through the housing of the cartridge (via one side port) to create vaporization of fluid within the counter current (or optionally, concurrent) flow of blood, e.g. hospital supplied air, desiccant dried air, or a commercial air drier. Condenser 216, in turn, is an apparatus which will be used to condense the water vapor removed from the blood. Vacuum pump 218 will be used to pull a vacuum through the condenser and in turn the WRT cartridge from the other side port of the cartridge housing. This will pull dry air through the housing and across the surface of the hollow fibers, removing water from the blood. As also shown, infusion pressure sensor  220 is attached to tubing (in-line) that will measure the blood flow pressure at the end of the system before it returns to the patient. Infusion Catheter 224 is positioned at a distal end of the system in order to return blood to the patient through a vein. At another terminal point, water vapor collection bag 222 will collect the condensed water vapor pulled from the blood by the WRT cartridge. In the schematic of FIG. 24, blood is withdrawn from the body through withdrawal catheter  200 (an IV catheter inserted in the vein to withdraw blood out of the patient and into the system) using blood pump 204. Blood pump 204 can be provided in the form of a roller pump that pumps blood out of the patient while minimizing damage to red blood cells. The blood can be monitored by withdrawal pressure sensor 202 that allows for the measurement of blood flow out of the patient before reaching the blood pump. Discrete portions of the withdrawn blood are delivered via control valve 205 to the respective inlet ports of both ultrafiltration cartridge 206 and WRT cartridge 212, for ultrafiltration and water removal therapy, respectively. The amounts sent to each cartridge, in terms of both total amounts and in relative proportions of the whole, can be varied using the valve, depending on desired outcome. Additionally, some or all of the ultrafiltrate can be directed to the inlet port of the WRT cartridge 212 for further processing, in the manner described below. In use, the withdrawal IV catheter  200 is placed in the vein. Once placed, the catheter is attached to the system's tubing set (to the end closest to the blood pump). The infusion IV catheter 224 can be placed at the same time into a separate vein in the patient and attached to the tubing at the opposite end of the system. Pressure sensors can be included in the circuit as desired, e.g., to monitor blood pressures flowing away from the patient and returned to the patient. Blood pump tubing is placed within the blood pump and connected to the first valve 205. The withdrawal blood pump 204 is turned on, to begin pumping the blood out of the patient and through the entire system. In FIG. 24, the valve 205 prior to the ultrafiltration and WRT cartridges can also be adjusted to allow the appropriate amount of blood flow to the lumens of both cartridges. On the ultrafiltrate cartridge  206, tubing is connected to the side port 207, which is in fluid communication with the extraluminal space, and attached to the ultrafiltrate pump 209. The ultrafiltrate pump contains controls for the rate of ultrafiltrate removal from the cartridge. In turn, the tubing is connected to a valve 211 that allows control over the rate at which ultrafiltrate is delivered either as waste drainage into the ultrafiltrate collection bag 210, or permitted to continue on to the WRT cartridge 212. Ultrafiltrate that flows to the WRT cartridge can therefore be concentrated further, with water vapor removed and solutes returned to the blood stream. A pressure sensor 208 allows pressure monitoring of ultrafiltrate removal from the ultrafiltrate cartridge. Another valve  221 is positioned just in front of (upstream from) the WRT cartridge 212 in order to permit control over the relative amounts of blood and ultrafiltrate that enter the hollow fibers 213 contained within the WRT. To create the WRT effect, one side port 217 of the WRT cartridge is connected with tubing to a dry air source 214 (for example, a hospital wall supply, a desiccant cartridge, or an air drier). Another side port 219 of the WRT cartridge is connected with tubing to a condenser 216 which, in turn, is connected to a vacuum source 218. The vacuum source pulls dry air through the cartridge housing, removing water vapor from blood via transmembrane conductance. The humidified air is delivered to a condenser 216, which in turn, delivers liquid water to the water vapor collection bag 222. The condenser operates by circulating cool water through an internal coil that condenses the external water vapor into liquid water. The condenser delivers liquid water to the water vapor collection bag. From the backside of both cartridges, tubing is connected, optionally via a valve  203, in order to permit recombining of the filtered blood before it re-enters the patient. A sensor is optionally and preferably placed here to allow the user to know the pressure at which the blood is flowing back to the patient. The tubing after the valve is connected to the IV infusion catheter that returns the blood to the patient. In the schematic of FIG. 25, a UF cartridge is used in series (here prior to) the use of a WRT cartridge. The blood components that are not removed from the ultrafiltration cartridge  206, therefore, are directed to the WRT cartridge 212 for water removal therapy. Water vapor is sent to the water vapor collection bag 222 while blood is delivered back to patient. In essence, the blood is subjected to ultrafiltration, with water removal therapy being performed on post-ultrafiltrate blood. This approach gives the highest combination of solute removal and solute concentration. On the other hand, blood will be of higher viscosity after passing through the ultrafiltration cartridge. Priming volume with two sequential cartridges will be increased. The system of FIG. 25 is set up and operated in a manner analogous to that described with respect to FIG. 24. For instance, blood pump  204 can be used to adjust the appropriate amount of blood flow to the lumen of the fibers within the UF cartridge. Ultrafiltrate from the UF cartridge, in turn, is delivered using ultrafiltrate pump 209 that contains controls for the rate of ultrafiltrate removal. Ultrafiltrate waste would flow directly into a waste collection bag 210. There is no further concentration of the ultrafiltrate in this schematic, post-ultrafiltrate blood would then flow directly to the WRT cartridge. The system is also operated in a similar fashion as described with respect to FIG. 24, in terms of the manner in which WRT is performed. Finally, in the schematic of FIG. 26, ultrafiltrate from the ultrafiltration cartridge  206 is delivered to the water removal therapy cartridge 212. Treated ultrafiltrate from the WRT cartridge 212 is delivered back to the patient along with blood from the ultrafiltration cartridge 206, again in a manner that permits both total and proportional amounts of each to be controlled. In essence, UF is performed on blood, with water removal therapy being performed on ultrafiltrate only. The advantages of this approach include: 1) reduced viscosity of ultrafiltrate compared to whole blood, and 2) reduced effect on hemoglobin levels of carbon dioxide and oxygen. On the other hand, this approach provides: 1) minimal effect on reduction of carbon dioxide and increased levels of oxygen if that affect is desired and 2) reduced flow rate of the ultrafiltrate through the WRT cartridge. Also, relatively high flow rates can often be required to prevent a drop in temperature, while low flow rates may require internal WRT cartridge heating. With the withdrawal IV catheter  200 positioned, the blood pump 204 is used to adjust the appropriate amount of blood flow to the lumen of the ultrafiltration cartridge. On the ultrafiltrate cartridge 206, tubing is connected to the side port and attached to the ultrafiltration pump 209. The ultrafiltration pump contains controls for the rate of ultrafiltrate removal. The tubing is connected to a valve 211 that allows control over the rate of drainage into the ultrafiltrate collection bag 210 as waste or onto the WRT cartridge. Ultrafiltrate that flows to the WRT cartridge is concentrated further, (water vapor only pulled out, solutes returned to the blood stream). To create the WRT effect one side port of the WRT cartridge is connected with tubing to a dry air source  214 (for example, a hospital wall supply, a desiccant cartridge, or an air drier). The other side port of the WRT cartridge is connected with tubing to a condenser 216 which, in turn, is connected to a vacuum source 218. The vacuum source pulls dry air through the cartridge housing, removing water vapor from blood via transmembrane conductance The humidified air is delivered to the condenser. The condenser operates by circulating cool water through an internal coil that condenses external water vapor into liquid water. The condenser delivers liquid water to the water vapor collection bag  222. From the back side of the WRT cartridge, tubing is connected to a suitable connection (optionally including a valve) that permits recombining of the filtrate (from the WRT cartridge) and filtered blood (from the ultrafiltration cartridge) before it re-enters the patient. A sensor 223 is placed after the WRT cartridge to allow the measurement of the pressure at which the filtrate is flowing out of the WRT cartridge. Another sensor 220 is placed after the final valve to measure the pressure at which the blood is flowing back to the patient. The tubing after the valve is connected to the IV infusion catheter that returns the blood to the patient. Recirculation of Post WRT fluid to maintain high flow and temperature. WRT Blood Gas Maximal concentration of all species. WRT UF HD Blood/Gas Gas/Blood Combination with maximal options. 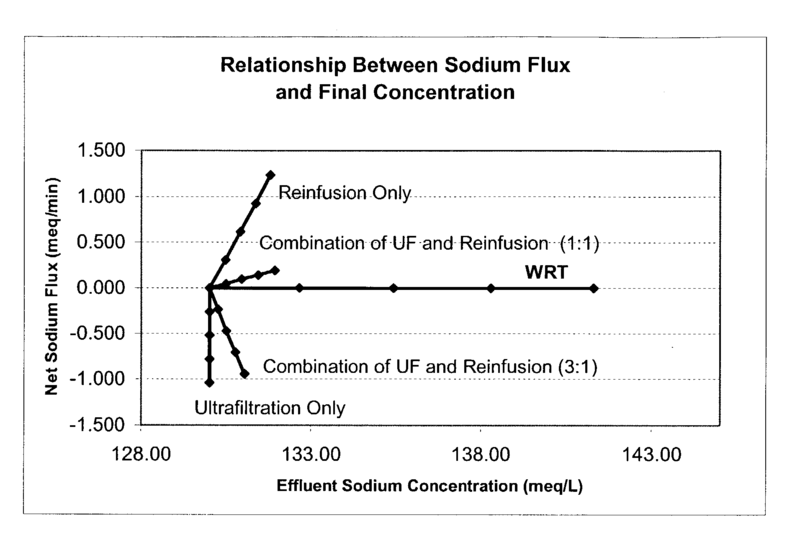 WRT UF HD RI Blood/Gas Gas/Blood Combination with maximal options. WRT UF RI Blood/Gas Gas/Blood Combination with maximal options. WRT UF RI HD Blood/Gas Gas/Blood Combination with maximal options. WRT HD RI Blood/Gas Gas/Blood Improved exchange, with maximal options. WRT HD RI UF Blood/Gas Gas/Blood Improved exchange, with maximal options. WRT HD UF Blood/Gas Gas/Blood Improved exchange, with maximal options. WRT HD UF RI Blood/Gas Gas/Blood Improved exchange, with maximal options. WRT RI Blood/Gas Gas/Blood Further options for specific concentrations. WRT RI UF Blood/Gas Gas/Blood Further options for specific concentrations. WRT RI UF HD Blood/Gas Gas/Blood Further options for specific concentrations. WRT RI HD Blood/Gas Gas/Blood Further options for specific concentrations. WRT RI HD UF Blood/Gas Gas/Blood Further options for specific concentrations. 1. A method of treating tissue swelling, the method comprising the step of employing one or more semipermeable membranes in combination with a hydratable medium in order to remove substantially only water through the semipermeable membrane(s) and from a biological fluid associated with the swelling. 2. A method according to claim 1, further comprising the use of one or more semipermeable membranes in order to perform ultrafiltration on the same or different biological fluid, in order to remove both water and permeable solutes from the biological fluid, and either in series or parallel with the water removal step. 3. A method according to claim 2 wherein the method is used to treat swelling associated with congestive heart failure, and provides a desired combination of ultrafiltration to remove water and permeable solutes, together with water removal therapy to remove substantially only water. 4. A method according to claim 3 wherein both ultrafiltration and water removal therapy are performed in an extracorporeal fashion. 5. 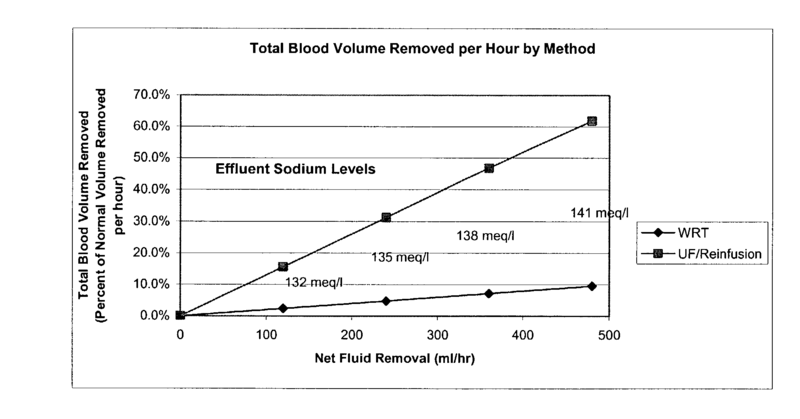 A method according to claim 4 comprising respective extracorporeal cartridges in which both ultrafiltration and water removal are performed in parallel on different aliquots of blood. 6. A method according to claim 4 comprising respective extracorporeal cartridges in which both ultrafiltration and water removal are performed in series, with water removal therapy performed following ultrafiltration, and on at least a portion of the ultrafiltrate. 7. A method according to claim 4 further comprising the step of reinfusing the treated fluid with one or more components prior to return to the body. 8. A method according to claim 4 wherein the method is used to treat swelling associated with congestive heart failure, acute renal failure, chronic renal failure, hyponatremia, or water excess syndrome. 9. A method according to claim 1 wherein the method comprises an arteriovenous method based on a pressure differential between arterial and venous blood to drive blood through a water therapy removal cartridge. 10. A method according to claim 1 wherein the method comprises a venovenous method based upon the pumping action of vaporization itself. 11. A method according to claim 1 wherein the cartridges each comprise a plurality of hollow fibers together with extraluminal and intraluminal flow paths, the hydratable medium comprises a desiccated gas delivered to the intraluminal flow path, and the biological fluid comprises blood or ultrafiltrate delivered to the extraluminal flow path. 12. A method according to claim 1 wherein the cartridges each comprise a plurality of hollow fibers together with extraluminal and intraluminal flow paths, the hydratable medium comprises a desiccated gas delivered to the extraluminal flow path, and the biological fluid comprises blood or ultrafiltrate delivered to the intraluminal flow path. 13. An apparatus for treating tissue swelling, comprising one or more semipermeable membranes adapted to be used in combination with a hydratable medium in order to remove substantially only water through the semipermeable membrane(s) and from a biological fluid associated with the swelling. 14. An apparatus according to claim 13, wherein the apparatus comprises a cartridge containing one or more semipermeable membranes and positioned in an extracorporeal circuit. 15. An apparatus according to claim 14 wherein the one or more semipermeable membranes are in the form of hollow fibers. 16. An apparatus according to claim 1 wherein the hydratable medium comprises a gas. 17. An apparatus according to claim 13 wherein the fibers are formed of materials selected from the group consisting of polyacrylonitrile, polyethersulfone, cellulose and polysulfone. 18. An apparatus according to claim 13, further comprising one or more monitoring components physically and/or functionally integrated with the placement and/or operation of the semipermeable membrane component. 19. An apparatus according to claim 18 wherein the monitoring components are associated with the system of this invention, in that that one or more components of the monitoring components are physically and/or functionally integrated with the placement and/or operation of the semipermeable membrane component. 20. An apparatus for treating tissue swelling, comprising one or more semipermeable membranes adapted to be used in combination with a hydratable medium in order to remove substantially only water from a biological fluid associated with the swelling, wherein the apparatus comprises a plurality of hollow fibers positioned within a cartridge in order to provide corresponding intraluminal and extraluminal flow paths within the cartridge, the flow paths being adapted to position both a biological fluid and a hydratable medium, respectively, on opposite surfaces of the fibers, under conditions suitable to remove substantially only water from the biological fluid.